The calculator makes predictions down to the minute based on this estimate. The figure is not that predictable or precise. Practice Parameters for Clinical Use of the Multiple Sleep Latency Test and the Maintenance of Wakefulness Test is a discussion on the Multiple Sleep Latency Test - where patients are given several opportunities throughout the day to fall asleep, and their sleep latency is measured. In Table 3, it gives mean sleep latency of 10.4 +/- 4.3 minutes or 11.6 +/- 5.2 minutes, depending on the protocol used. In Meta-Analysis of Quantitative Sleep Parameters From Childhood to Old Age in Healthy Individuals: Developing Normative Sleep Values Across the Human Lifespan they look at how sleep latency changes over time and between genders. 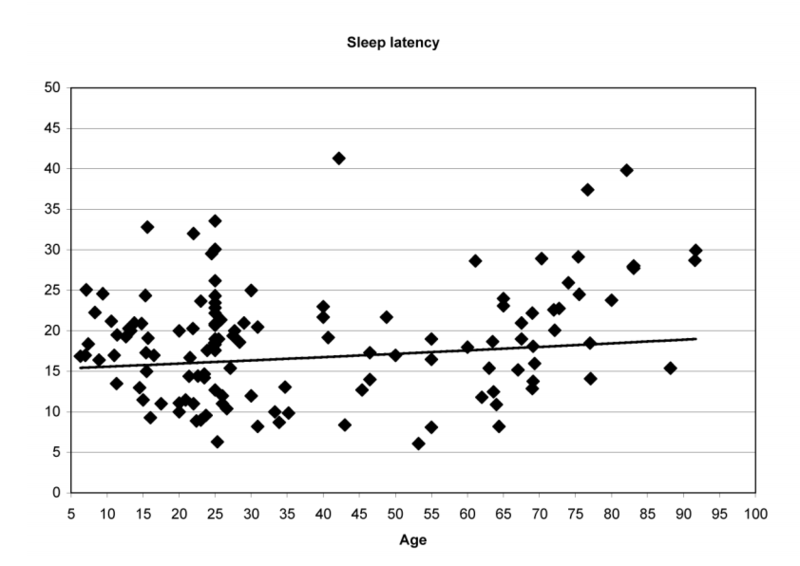 Overall, it appeared that sleep latency modestly but significantly increased with age. However, the change is very subtle [...] The overall increase in sleep latency between 20 and 80 years was less than 10 minutes. They also showed men have higher mean sleep latency. In Figure 1A they showed a scatterplot which gives a good idea of the range (and trends). Note the trend line is somewhat higher than the previous reference. In summary: 14 minutes is around the right time, but planning your alarm clock wake-up time based on such a precise figure isn't warranted.